To say that I love salads is understatement. I can make a mean meal with some greens! 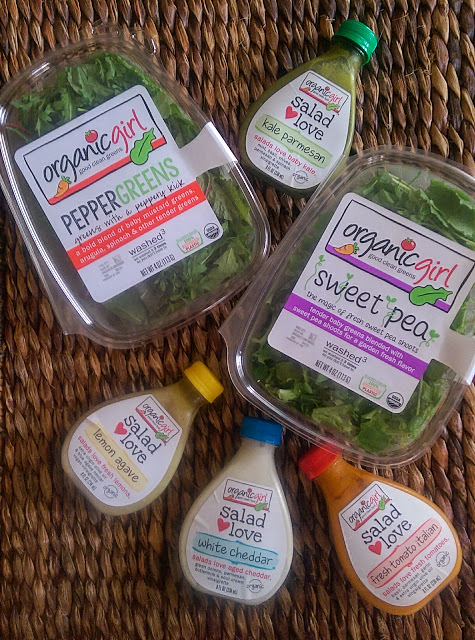 So when organicgirl sent me their newest greens sweat pea and PEPPERGREENS and their new line of salad love dressings, my brain started reeling with fun salad styles. Normally, Iron Chef Allan and I make our own salad dressing, but these new organicgirl dressings are made with REAL ingredients and are as good as homemade. The flavors are fresh, bright and honestly taste like something we would whip up in the kitchen. These organicgirl salad love good-as-homemade dressings are perfect for healthy dressings in a pinch and they’re great veggie dips for kids, too! As for my salad inspiration, I was immediately drawn to the sweet pea blend because I love the sweet crunch and protein that raw baby pea shoots and snap peas add to any meal. Thinking about peas reminded me of the “Peas and Macaroni” dish my mom used to always serve when we were kids. For those that don’t know, Peas and Macaroni is an Italian American version of Mac and Cheese and an ingenious way for kids to eat their greens. However, we won’t talk the carb content in a traditional serving of Peas and Macaroni, ok. To do so would be just cruel to any Italian American addicted to pasta. Instead, let’s focus on the protein in this gorgeous pile of sweet pea greens (5 grams per serving). Toss in some baby sweat peas and any salad will really pack some protein power! 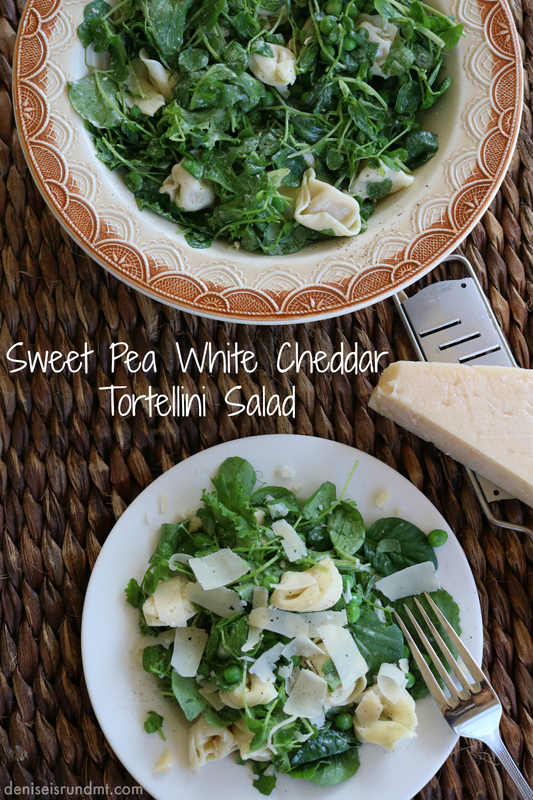 To create a healthier, greener version of Peas and Macaroni, I used the organicgirl sweet pea blend, refrigerated tortellini, some frozen sweet peas and organicgirl white cheddar salad love dressing. Toss it all together and the results are a salad that takes a traditional pasta salad to another level. A healthy cheesy pasta salad to serve as a side dish or a meal. Pour peas into colander. Drain pasta over the frozen peas to “cook” the peas. Blanch the peas and tortellini in a large bowl of ice water. In a large bowl, combine tortellini, peas and organicgirl sweet pea salad. Pour in white cheddar salad love dressing and lightly toss through the salad until well covered. Cover with plastic cling film and allow salad to chill an hour before serving. Serve with fresh ground black pepper and shaved Parmesan. Organicgirl products are available at grocery stores and natural food markets nationwide, including Whole Foods Markets and Publix Super Markets. To request availability at your local store, print and submit this product request form to your produce manager: www.iloveorganicgirl.com/requestus. Savor the newest organicGirl #FlavCraze. Follow OrganicGirl on Facebook, Twitter, Instagram and Pinterest. Just in time for the holidays, enter to win an organicgirl #FlaCraze Giveway featuring the new salads and all four dressings, valued at $40. To enter the organicgirl #FlaCraze Giveway, tell me what organicgirl greens or Salad Love dressing has peaked your #FlavCraze. For additional entries, follow the Rafflecopter prompts. What organicgirl greens or salad love dressing has peaked your #FlavCraze? This entry was posted in family life, food, health, Life, recipe and tagged food, healthy, Life, Organicgirl, recipe, Run DMT, salad, side dish, sweat pea, vegetarian, veggies. ← Newsies Seize the Straz! Wow this looks so yummy. I’ve never had pea shoots, but I am game to try them. After reading your description of the flavor profile, I may have to make this over the weekend! YUM!!! That looks so good. I too love the sweet pea greens, they are so tasty! The White Cheddar dressing has definitely peaked my tastebuds’ interest!